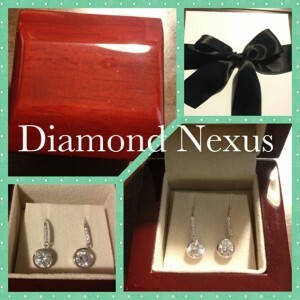 Diamond Nexus Review and Giveaway! Diamonds are a girls best friend (or so they say!) I just think girls like sparkly things that make us feel pretty and this frugal girl has some issues with not only the cost of real diamonds but the cruelty and ethics of mined diamonds. But to my surprise there’s an awesome company that shares my view and create the most stunning lab created pieces………..enter Diamond Nexus! I got the the Mia earrings, which are these gorgeous dangling stimulant drops on stud encrusted fish hooks. The center stone is 1.03 carats and the total weight is 2.11 carats. There are set on Lorián Platinum which is brilliant and lightweight. Needless to say I am in love! I have very delicate ears and I can’t even wear silver for too long, I wore these the entire weekend and they felt perfect. 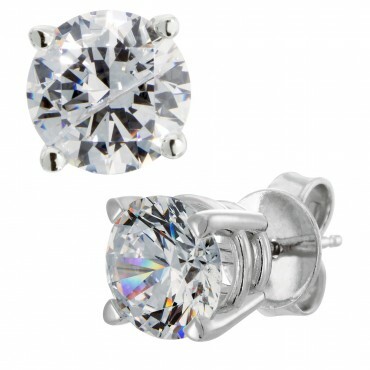 You can find everything from jaw dropping engagement rings to always in stud earrings and customized them by picking size, style, setting and choice of 14K yellow gold, white gold and platinum. This last option is the greatest to me, most places that offer lab created gems usually set them on non precious metals. Diamond Nexus stones are tough and last just as long as mined diamonds. Their quality is amazing and NO ONE will be able to tell they are not real diamonds, not even a jeweler could tell the difference. Can you? Inspect, enjoy, and wear your Diamond Nexus jewelry for 30 days. If you are not thoroughly satisfied, even elated, will be cheerfully refunded. If a Diamond Nexus ever fades, discolors, or becomes damaged, (which it won’t!) a free replacement will be granted. If a Diamond Nexus stone is ever lost from its setting, they will replace it with only a nominal re-mounting charge. No insurance required! Did I mention that Diamond Nexus has been the creator of the Miss Universe and Miss USA crowns for many years? Yeah, I know! 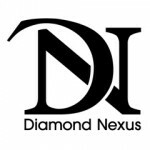 You can find Diamond Nexus HERE, make sure to like them on Facebook and follow them on Twitter. Now for what you guys have been waiting for, one lucky Austin Couponing fan will win a pair of Round cut Studs, tension back/basket set on 14k gold. These would be the perfect complement to any outfit, so gorgeous and I am so jealous All you have to do is enter below. 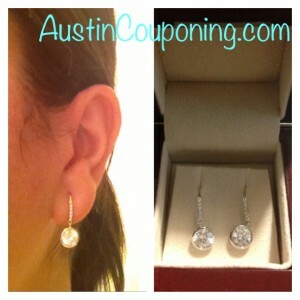 This entry was posted in Giveaways, Reviews and tagged austin couponing, Diamond Nexus by AustinCouponing.com. Bookmark the permalink. I love the ones you reviewed – hard to pick a fave, though. I also love that these are not mined. I’m outspoken against the diamond mines in Africa and the killing that goes on over there. I won’t buy a real diamond. EVER. I love them! Super comfy and cute! I agree it’s great to finally find a quality stimulant good luck! I love the Belle Vintage Engagement Ring!!! my favorite is the cleopatra! Thanks for this giveaway! I like the Cherise earrings. Very pretty! I love the Tabitha ring!!!!! OMG! I love it! Good one! I love the Juliette engagement ring, it is vintage and beautiful. I love the Anna earrings. Thank you for this! I love sparkly things! I want a tennis bracelet!!! Never heard of Diamond Nexus! I am loving it! Please Please they are so pretty! The zeina engagement ring is unique and interesting. Good choice! I like it! Good luck thanks for entering!